The interstate cordial relations marks the idealistic approach that states are determined to pursue in the century of economic growth and development. This approach has vigorous attraction for Russo-Pak ample strategic relations. The Russian authorities, very recently, were on official trip to Islamabad where a few projects were signed to start by the Russian companies, including a gas pipeline project, which would stretch from Karachi to Lahore. This has opened an era of warm relations between the two important states of international system. In fact, there is noteworthy canon that there is no permanent friend no permanent enemy in international relations. Actually, the history of relations between Pakistan and Russia used to sound with intermittent contacts. The pre-1991 era witnessed the diplomatic relations to be in impasse save the Bhutto era in Pakistan from 1972- 1977. The formative era soon after independence, ranging from 1947 to 1958 is marked with Pakistani orientation into the western block, namely SEATO and CENTO, a challenger to USSR, ignoring the Soviets by Pakistani junta. This is the neophyte of disparate ways ensued by the two sides. Thus, the misunderstanding and ill will gets mounting with passage of time. USSR vividly assisted India financially, militarily and diplomatically in the latter's bloody wars against Pakistan in 1965 and then in 1971 when Pakistan disintegrated and Bangladesh became a separate state in wake of civil war. The strategically mis-perception was immensely converted into the adversarial relations and the hostility between both states were at the apogee when USSR had invaded Afghanistan in December 1979. Consequently, this development resulted in the protracted warfare backed by Pakistan against the occupying Soviets troops in the porous, bewildered and difficult Afghan terrains. This flagrant game met with formidable end when USSR got trapped and left unable to sustain this prolific military standoff and haplessly experienced disintegration in 1991 and was polarized into 15 states each with respective sovereignty. Among these proceeding states, Russia stands as the philistine inherent and the largest in both demography and geography. Strategically, Pakistan can play a positive role in helping Russia to have access to Saudi Arabia and the rest of Arab Peninsula, mega rich in natural resources and possessing an enormous Geo-strategic position. Regionally, Pakistan may remarkably pacify the ardent Islamic separatist movements, determined to undermine the Russian internal security and integrity, playing the card of pan-Islamism. Additionally, the seaports of Gwader and Karachi have the potential to stimulate the shorter, quicker and probably cheaper communication to Russia and CARs (Central Asian Republics) for the transnational shipments. The Indian Ocean, strategically and Geo-economically, is getting pertinence more than earlier in the forthcoming scenario. It has become an epic center of energy transportation line, directly influencing the energy security of rest of the world. Further, on the outer gamut of this maritime trade hub, Pakistan exists as most significant regional power, developing nuclear might and establishing a bulk war of naval defense. Thus, Pakistan's predilection towards Russia may be proved as fertile for the latter. Subsequently, the Russian cooperation to Pakistan may be sought in the following subjects. (a) The Prime Minister of Pakistan Zulfikar Ali Bhutto laid the foundation stone of this vital and gigantic project on 30 December 1973. The huge construction and erection work of an integrated steel mill, never practiced before in the country, was carried out by an association of Pakistani construction companies under the overall command of Soviet experts. This project could be increased and some other facilities could possibly be erected by dint of the Soviets Cooperation. (b) Given the defense sphere, Russia can provide with Pakistan the defense assets and may also help the latter develop its own stealth technology in its ongoing thunder projects. (c) Russia has worth-mentioning nuclear development for civilian purposes. It may give Pakistan nuclear reactors to produce power in order to mollify the ongoing energy dearth experienced by the latter. Another development could also be seen when the respected Russian leader visits Pakistan. That is to symbolize a concord with Russia to endow with Pakistan the huge stock piles of uranium and plutonium, likely to be enriched in Pakistan. 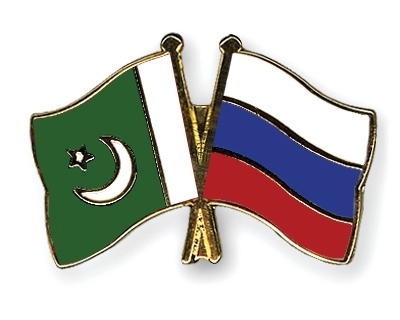 Finally, Pakistan and Russia could work warmly in the subjects as explicated in previously mentioned tenets and this relation may be helpful in order to cope with the regional and strategic challenges.